Jacks Point Golf Course has a back drop of 2300 vertical metres of the razorback Remarkables mountain range and an armchair view of an outstanding lake and mountain panorama, Jacks Point Golf Club is not only one of the most spectacular in the world, but as an 18 hole par 72 championship course it offers golfers of any calibre a challenging and unforgettable experience. Jacks Point golf course works with nature, not against it. Designed with minimal excavation, the 6388 metre (7088 yard) course is built on the most spectacular of Jack's Point terrain, weaving through tussocks grasslands, dramatic rock outcrops, steep bluffs and swathes of native bush to the edge of Lake Wakatipu. 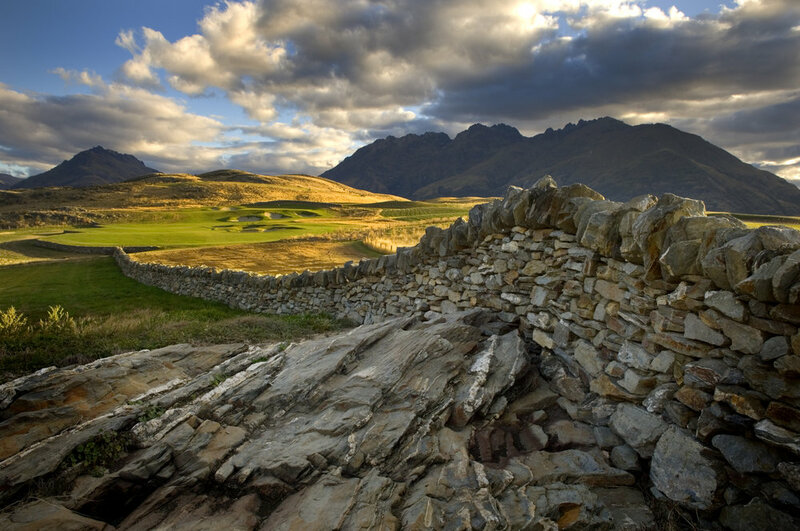 Stone walls adjacent to the fairways evoke its high country farming heritage, so the entire Jacks Point golf course has been designed to take advantage of its history and terrain - raw, dramatic and wild. With preservation and restoration of the surrounding wetlands, matagouri and native bush, each hole has been carefully aligned to a magnificent backdrop, offering the player a full 360 degree experience of the high country landscape. Jacks Point Golf Club has a pro golf shop which contains a range of gents and ladies golfing apparel, along with accessories to make your experience at Jack's Point even more enjoyable, with knowledgeable staff on hand to assist all visitors. Professional coaching is available by appointment (NZPGA qualified) and a magnificent driving range is adjacent to the clubhouse, for all to enjoy. Peak Golf Queenstown provide a green fees booking service for Jacks Point golf club. Book your Jacks Point golf course green fees and reserve a round today by calling Stephen Jensen on 021 784 339. We can also provide luxury van transport to and from your hotel accommodation to complete your golfing experience. Professional coaching: (individual or group) sessions available by appointment.